The early paintings of British artist Graham Sutherland (1903-1980) seem to be about moments of intense feeling which occurred while he was immersed in the country. He seemed to be a landscape painter in the tradition of Samuel Palmer. These paintings were mystical rhapsodies rather than objective studies. Something happened to him – perhaps it was the war or perhaps his original vision faded – that led him to move out of this private world into the public domain. He started to paint religious themes, larger landscapes, and eventually official portraits. The things that distinguish his latter from his earlier work are larger scale, a plain, easy to read format and simple colour. However, there is one recurrent theme in his work – an interest in twisted, convoluted forms. His landscapes are dominated by cactus and thorn and a personal rhythmic twist crops up everywhere. He found that he had to comment on the Nazi atrocities and embody his feelings about them in works that were accessible to ordinary people. It seems he felt a real responsibility about this and he found support in the paintings of Grünewald who faced suffering without flinching and whose twisted forms and stark colour appealed to Sutherland. ‘I tell you solemnly that in so far as you did this to the least of these brothers of mine, you did it to me.’ Our Lord will say to this to the saved, but the reverse is also true. It was Jesus who was re-crucified at Buchenwald and human nature, which can apparently become completely depraved in a couple of days, committed these atrocities. It seems we are all capable of committing heinous acts. How can an artist respond to facts like this? Primo Levi says that it is impossible to mention providence after the holocaust. Sutherland did not see it that way. His response was to point to the fact that the victims of the holocaust were so many Christs and in order to do so he represented a victim who could be either Jesus or some other Jew being lowered into a tomb in 'concentration camp-like' surroundings. He has had the artistic tact not to force this image on us, but just to present us with the plain, simple facts. The face is left blank – it could be anyone, but it is always Jesus. The Cross overshadows us all. Graham Sutherland (1903-1980) studied engraving at Goldsmiths College in London from 1920 until 1925. He turned to painting in the 1930s and quickly gained an international reputation. During World War II he was named an official war artist for Britain, an experience which shaped the remainder of his career. 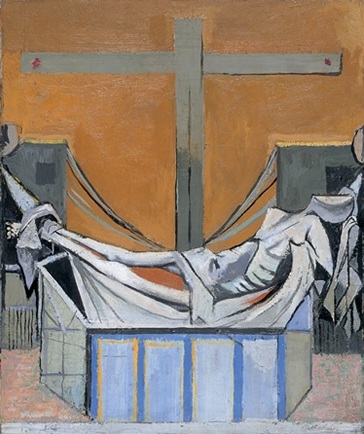 A convert to Roman Catholicism, he painted his first religious scenes in the late 1940s – images of Christ’s passion informed by and commenting on the horrors of the Holocaust. In the 1950's Sutherland found his strength in portrait painting. His many stays in southern France inspired his works in the 1960's. He designed the vast tapestry Christ in Glory installed in Coventry Cathedral in 1962. Labelled a Neo-Romantic, Sutherland belonged to no school but was regarded as a master in his own right. He participated in many exhibitions which confirm his international reputation, including the Documenta in Kassel in 1955, 1959 and 1964. He had an enormous impact on the next generation of artists in England. The above text by Francis Hoyland was part of the lecture 'A critique of the paintings in the MCCMCA', given at the opening of an exhibition of the Collection at the Royal West of England Academy, Bristol, January 2003. For the full text of this lecture, click here.